After reviewing The Madman Inside demo from VII Gates, I was fairly confident that the band would secure a record deal based on the content of those six songs. Sure enough, Sound Riot Records inked the band to a contract, and here is the official debut release of the band, Fire, Walk With Me. This official debut album contains the six songs from the aforementioned demo, plus 4 new tracks. Since I have previously heard 6 of these songs when I reviewed VII Gates demo last year, I was very eager to see if the guys new material would be of the same quality level as the demo material. The four "new" songs, Bounded By Hate, Seconds Left to Live, Under The Crossed Bones, and A Dark Room of My Mind deliver the goods! This is a very talented band in many aspects. First of all, I appreciate (as I think many other will also) the throughtful lyrics. You won't hear the tired stories of unicorns, dragons, and warriors off to battle on this album. Instead, these songs deal with the emotions and inner struggles that many of us face day to day. Vocalist Chriss Blackburn reminds me quite a bit of the Heavens Gate lead vocalist. However, the 4 newer tracks from this album show Chriss adapting more of a Rob Halford influence into his delivery, quite well I might add. His delivery is still melodic and emotional and the high pitched wails are well placed where the music demands, and are not overused. The music itself can best be described as melodic heavy metal, although shades of a hard rock and even subtle progressive qualities find their way into the music. Each of the songs has its share of recognizable melodies that manage to stick with you long after the album runs its course. The guitar work throughout the album is impressive, with the four newer tracks displaying a stronger hint of Judas Priest style riffing (see Seconds Left to Live). Also, the rhythm section is solid and the drummer provides some interesting twists to keep things interesting. Keyboard textures are well placed to enhance some of the melodies and to reinforce a particular mood of a song. All these qualities come together naturally to form excellent songs that flow very easily from one song to the next. It seems that each tempo change, melody, riff, and drum beat has been well planned, just as a chef would plan and calculate the necessary ingredients for a cake to taste "just right." VII Gates have a knack for writing great songs and they also have dedicated musicians to execute the music in fine fashion. Not too many bands are able to swoop a 7+ minute song out of their pocket (The Madman Inside and The Dark Room of My Mind) and keep it interesting throughout. There are a handful of songs on this album that exceed 5 minutes, yet none of them "drag on" needlessly into boredom. 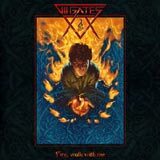 VII Gates have certainly impressed me with their debut album. The quality of the songs and the consistency of the album is especially impressive for a debut album. With the proper exposure and marketing, I'm sure VII Gates will win over a lot of fans in the melodic metal world with this album. The combination of thoughful lyrics and interesting compositions should be enough to at least seperate them from the many cookie-cutter bands out there.